The Agriculture Law Education Initiative (ALEI) and the Hughes Center for Agro-Ecology, Inc. (Hughes Center) presented a series of five workshops over December 2018-January 2019 across the state. These workshops taught farmers, landowners, and agricultural service providers strategies to implement conservation practices on leased land, emphasizing farm lease agreements. The workshops were supported by a grant from the National Institute of Food and Agriculture, U.S. Department of Agriculture, through the Northeast Sustainable Agriculture Research and Education program under sub-award number ENE18-151. Despite the potential for positive impacts, surveys show that agricultural best management practices are less prevalent on leased acres for a variety of reasons. Informal or “handshake” leases lack the long-term stability many farmers want before investing increased labor and resources on leased farmed land. Workshop attendees learned about how the use of simple leasing agreements can encourage best management/conservation practices. The workshops included a presentation on how additional on-farm conservation practices will benefit the Chesapeake Bay clean-up, a chance for attendees to interactively apply learned principles, and a panel of agricultural experts addressing participant questions and comments. ALEI will provide 2 years of technical support to the 75 ag service providers who attended the workshop. This technical support is aimed at equipping these providers to assist farmers and landowners in their region in using a lease to support on-farm conservation practices on leased land. In December, the National Sea Grant Law Center awarded Maryland Sea Grant $10,000 to explore building legal capacity to meet the legal needs of coastal communities in Maryland, the greater Delmarva, and Mid-Atlantic regions. Maryland Sea Grant and ALEI teamed up with Delaware Sea Grant to submit paired proposals and both programs were funded, allowing the two states’ programs to work together to create more comprehensive legal resources and programming for the region. Nicole Cook, ALEI’s legal specialist on the Eastern Shore, is a partner on this project and the Maryland aquaculture industry is a focus of her work. “The purpose of this grant is to understand how to build the legal capacity of Maryland Sea Grant to provide legal education to constituents. ALEI has an interest in supporting the ‘aquaculture-agriculture’ in Maryland. That will be an interest in this program,” Cook said. Sea Grant is a partnership between the nation’s land grant universities and the National Oceanic and Atmospheric Administration (NOAA). The National Sea Grant Law Center, located at the University of Mississippi, was established in 2002 to coordinate and enhance Sea Grant’s activities in legal scholarship and outreach related to coastal and ocean law issues. This Phase I grant will fund research and needs assessment activities, pilot workshops and events, and other activities necessary for the launch of a new program. Both Sea Grant collaborative teams in Maryland and Delaware plan to conduct a needs assessment to determine what issues are specific to each state, and which issues overlap. Maryland Sea Grant and Delaware Sea Grant will also consult with Virginia and Georgia Sea Grant, both of whom have existing legal Sea Grant programs. “Part of what we will do is work with Virginia Sea Grant and the Virginia Coastal Policy Center at the College of William and Mary Law School to determine what models can work in this region,” Dr. Moser said. “Currently there are multiple coastal legal issues we could address, from waterfront ownership rights, drainage problems, environmental regulations, and climate change. There is a lot of ground to cover,” said Cook. Each winter season, the University of Maryland Extension (UME) holds agronomy, fruit, and vegetable production meetings to share the most current research and information with Maryland farmers, crop advisors, and agricultural professionals, informing 2019 growing decisions for agricultural crops. ALEI legal specialists attend various meetings across the state each winter to provide legal education to attendees. On average, these meetings attract over 800 people every year. Sarah Everhart, ALEI legal specialist and managing director of ALEI at the Francis King Carey School of Law, joined the Northern Maryland Agronomy Meeting last December to discuss legal responsibilities employers have for employees handling pesticides. “Farm employers, according to the federal Worker Protection Standard (WPS), have many responsibilities related to preventing pesticide exposure. The WPS underwent some fairly recent updates and I felt it was important to educate growers on these new legal obligations,” said Everhart. Everhart also joined the Eastern Shore Growers Meeting on February 12, 2019, to discuss recordkeeping responsibilities and other elements of the Food Safety Modernization Act’s Produce Safety Rule. Paul Goeringer, an extension legal specialist at the Department of Agricultural and Resource Economics, University of Maryland, spoke at meetings in Caroline County, Carroll County, and Cecil County, discussing issues related to right-to-farm laws. Goeringer’s presentation focused on how Maryland’s right-to-farm law could potentially apply in lawsuits similar to those facing the hog industry around the country. 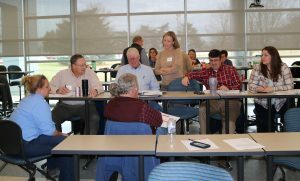 Nicole Cook, ALEI’s legal specialist at the University of Maryland Eastern Shore, joined the Lower Shore Agronomy Meeting on Jan. 30 to discuss the 2018 Farm Bill’s farm safety net programs. Cook also presented to farmers about the Food Safety Modernization Act’s Produce Safety Rule on Feb. 7 at the Southern Maryland Vegetable and Fruit Conference. Do you have a legal topic that you would like us to cover at an Agronomy Day or in an article, webinar, or blog post? Please let us know via email at umaglaw@umd.edu or phone at 301-405-1271. Since 2013, ALEI-affiliated faculty members have traveled across the state to participate in farm succession and estate planning workshops for Maryland farmers. This winter, ALEI’s Mayhah Suri and Paul Goeringer presented at two workshop series providing legal education and other resources to regional farmers and producers. “We regularly conduct surveys to understand the legal needs of farmers. Farm succession and estate planning are often noted by farmers as areas they want to learn more about,” said Goeringer. At the first workshop series, Transferring the Farm to the Next Generation, Goeringer discussed Estate Planning and Tax Basics. Goeringer’s presentation covered the relative advantages and disadvantages of different estate planning instruments, estate planning principals, tax basics, and other issues including conservation easements and sweat equity. Dale Johnson, UME farm management specialist, and Shannon Dill, UME ag educator, guided farmers in developing and using a business plan in the farm succession process, using the downloadable Farm Business Planning Workbook as a reference. Other presentations included communication strategies, managing woodlands, and developing a successful succession plan. A new workshop series, entitled Investing in Your Farm’s Future, was offered to farmers in January 2019. Mayhah Suri, a faculty specialist, discussed Brewing Down on the Farm: Value-Added and Succession Planning. Her presentation covered opening a microbrewery as a way to add revenue and expand the management of a farm operation. Suri discussed the licensing requirements and state and federal laws associated with opening a microbrewery in Maryland. This workshop series also covered retirement planning, communications, conservation easements, essentials of a successful farm succession plan, and more. ALEI continues to partner with the Department of Agricultural and Resource Economics, the University of Maryland Extension, and other partners and sponsors to provide education on farm succession and estate planning in upcoming years. ALEI publications dealing with farm succession and estate planning topics and value-added resources are available in our publication library.